Obafemi Awolowo, also known as Chief Obafemi Awolowo (born March 6, 1909, Ikenne, Colony and Protectorate of Southern Nigeria [now in Nigeria]—died May 9, 1987, Ikenne), Nigerian politician, who was a strong advocate of independence and nationalism. The son of a peasant, Awolowo first studied to be a teacher and later worked as a clerk, trader, and newspaper reporter while organizing trade unions in his spare time. He went to London to study law in 1944, and while there he founded the Egbe Omo Oduduwa (Yoruba: “Society of the Descendants of Oduduwa”), a Yoruba cultural society, which later was the basis for a Yoruba political party, the Action Group. During this period, Awolowo also wrote an influential nationalist tract, Path to Nigerian Freedom (1947). In 1947 he returned to Ibadan to practice law, founded the Action Group in 1950–51, and became its first president. He won the first Western region elections in 1951 and was chosen minister for local government structure, for which he established elective councils. From 1954 to 1959, as premier of the Western region, Awolowo worked to improve education, social services, and agricultural practices. Meanwhile, he tried to build the Action Group into an effective nationwide party, making alliances with ethnic groups in other regions. After a disappointing showing in the hard-fought 1959 elections and after the two other major parties had formed a coalition, he became leader of the opposition in the federal House of Representatives. 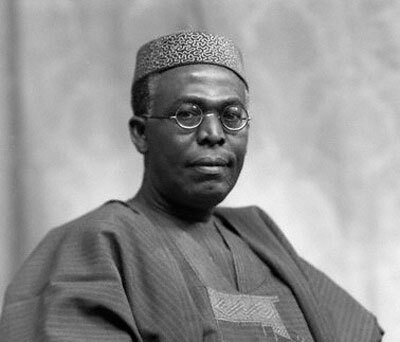 After Nigeria achieved independence in 1960, Awolowo began to modify his earlier position, leaning toward socialism and advocating a neutral foreign policy rather than his earlier pro-Western position. With dissension growing in his own party over both ideology and appointments to key positions, Awolowo fought to maintain ascendancy. Although he managed to prevail at the annual party conference in 1962, one year later he was tried and convicted of conspiracy to overthrow the government and was sentenced to 10 years in prison. He was released after a military coup in July 1966, and, in the confused events of the next year and after some indecision, he eventually threw his support behind the federal government against the southeastern Igbo secessionist state of Biafra. During the conflict, Awolowo was federal commissioner for finance and vice president of the Federal Executive Council. In the mid-1970s he was chancellor of the University of Ife (now Obafemi Awolowo University) and Ahmadu Bello University. When the 12-year ban on political activity was lifted in 1978 in preparation for a return to civilian rule, Awolowo emerged as the leader of the Unity Party. He ran for president in the elections of 1979 and 1983 but was defeated both times by Shehu Shagari. Following a military coup at the end of 1983, parties were once again banned, and Chief Awolowo retired from politics. An important figure in Nigerian nationalism, he wrote several books, including Awo: The Autobiography of Chief Obafemi Awolowo (1960) and Thoughts on Nigerian Constitution (1966).